Customized Email Management Solutions | Webservio Inc.
See what the power of email customization can do for your business. Email Routing and Email Relaying are invaluable email management solutions that are often overlooked. If you have an email challenge that you have been unable to resolve to your satisfaction, Message Routing and/or SMTP Relaying may be the solution you've been looking for. Many of our clients were told by other providers that the type of messaging solution they needed did not exist. Webservio's skilled engineering team is able to achieve what many email hosts deem 'impossible.' Schedule a free phone consultation today to discuss the email management challenges of your organization, and see how our Message Routing and Message Relaying services can work for you! Webservio's Email Routing services will deliver messages for the same domain to multiple mail servers or recipients based on customized rule sets. This type of functionality allows you to take control of your company's email and direct messages to the appropriate department or person. Email Routing helps an organization keep track of important emails and allows for managerial oversight. For example, you could have a copy of all emails addressed to sales associates also be delivered to sales@yourdomain.com. Routing solutions are also highly effective at organizing large volumes of emails to ensure important messages are not overlooked. For example, a domain rule could make sure that all emails from priorityclient.com are copied to the assigned account representative. Email routing can be used in conjunction with email archiving and inbound or outbound encryption as part of your company's data security and compliance measures. Policy-based email signatures or disclaimers can also be added. Different versions can be used depending on the sender, recipient, time of day, month, or other conditions. These types of customized email solutions can really give your business a competitive edge. Multiple routing nodes in at least two geographical locations provide maximum uptime and reliability. Create custom email routing rules based on sender, recipient, time of day, time of year, subject, email content, and more. 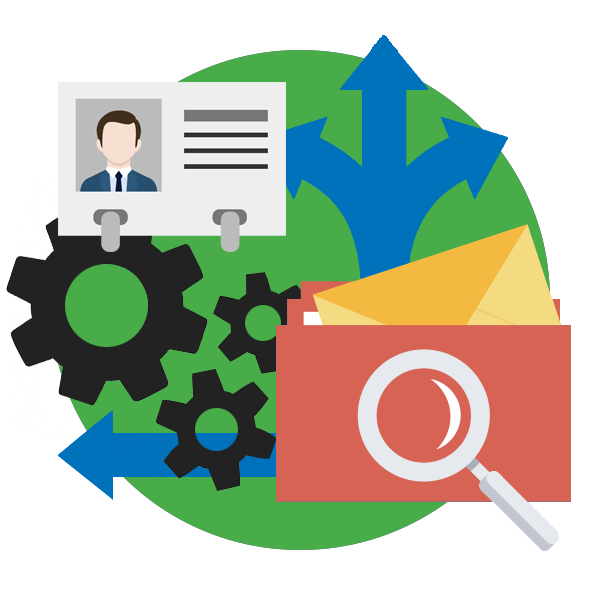 Duplicate inbound or outbound messages and route duplicates based on sender, recipient, or domain. The message is also still delivered to the original recipient. Alternately, the message can be redirected or deleted. If the recipient mail server is not available, messages will be queued and delivery retried on a set schedule. If you would like to learn more about Webservio's Message Routing solutions, contact us or schedule a phone consultation today. Webservio's Email Relaying services can ensure critical message delivery and provide a way to enforce email policy compliance within your organization. A relaying service can also be used to circumvent mail server reputation issues or manage delivery of emails to a large number of recipients. Your business can't afford delivery problems with important emails like invoices, reservation bookings, and service tickets. In addition, messages sent as part of a digital marketing campaign are more likely to be labeled as spam. Your mail server's IP address could be blacklisted, leading to email delivery delays and failures. Sending to large email lists through your primary mail server can also delay the delivery of more time-critical messages. Using a separate relaying system for automated emails safeguards the reputation of your primary mail server and ensures timely message delivery. Webservio's Message Relaying service gives you full control over server and DNS settings to maximize the delivery of important information. If your organization is using shared email hosting, you are probably using the same IP address as other accounts on the server. This configuration means that your email delivery could be negatively affected by the actions of others on the server despite your company's best efforts to maintain secure and compliant email policies. With Webservio's Message Relaying service, you can send messages through an alternate mail server dedicated to your organization's use. An Email Relaying service can alos be used to enforce outgoing email compliance policies and/or encryption across the whole organization or certain sub-sets of employees. Better yet, the rules are applied no matter what email client or device is used. This configuration gives you peace of mind that all policies are being met, while giving your employees the flexibility to use their laptop or mobile device in addition to their usual desktop computer. Webservio's VPS-based systems relay messages solely for your organization, and they include a dedicated IP so that you are in control of your IP reputation. Cloud-based relaying services are also available. With a VPS system, it is simple to request additional server resources as needed to accomodate your company's growing email volume. Cloud systems automatically adapt to the load demands. All of Webservio's systems can be quickly deployed within one business day or request Emergency Set-up for deployment of a VPS system within one hour. In order to utilize Webservio's Email Relaying solutions, it will be necessary to configure a SmartHost on your mail server. This is typical of any type of relaying service and should not be a difficult task for most server administrators. If additional assistance is needed, we offer Extended Provisioning services to provide step-by-step instructions for configuration and testing. Unlike other hosts, Webservio's Email Relaying services do not put a limit on the number of emails you can send. By default, outbound filtering is disabled to allow for unhindered relaying. However, Webservio does offer Email Relaying services that include outbound email filtering, including spam/virus filtering, encryption, and/or compliance policy enforcement. If you would like to learn more about Webservio's Message Relaying solutions, contact us or schedule a phone consultation today. Do your email users have different needs? If so, Webservio's Hybrid Email is the best way to provide them with the proper messaging environment while saving money! Give some users the powerful features of Microsoft Exchange, Office 365, or G Suite while others utilize Webservio's Izzymail, a more cost-effective and secure VPS-based email system. Unlike with other hybrid solutions, users on all systems can continue using the same domain! Hosted Exchange, Office 365, and G Suite provide enterprise-level functionality for end-users. Your employees can work with one another in a collaborative environment using shared calendars, global address lists, tasks, and notes. Webservio's IzzyMail provides a secure, VPS-based environment with all the features a typical email user needs, including spam/virus filtering, webmail, online calendar and contacts, along with POP and IMAP capabilities. Webservio's Hybrid Email gives you the flexibility to choose the options that make sense for your business. For example, you could continue to use an in-house Exchange server for corporate accounts, utilize Office 365 for outside sales reps, and provide Webservio’s Izzymail to other employees. Use multiple domains if you wish, keep all users under the same domain name, or have several domains with users on each spread across multiple mail servers. The high-powered features of Webservio's Routing systems allow you to decide what works best for your organization. No matter what type of configuration you choose, Webservio’s Hybrid Email with Email Routing is likely to provide a considerable cost savings compared to the cost of keeping all users on your in-house Exchange, or moving all users to a cloud solution. Hosting all email accounts on your internal Exchange server requires the purchase of Microsoft Exchange software licensing, compensation of IT staff for maintaining and updating the system, electricity, additional bandwidth required to efficiently run the mail server, and any spam/virus filtering. Although moving all users to a cloud-based email service could be less expensive than hosting your own internal Exchange server, many of your users may not need all the features of Exchange. You can realize a significant cost savings by using a cloud email solution only for the employees that really need the high availability and collaboration features. In addition to all its other benefits, Webservio's Hybrid Email includes Email Routing. Routing allows you to take control of your company's email and direct messages to the appropriate department or person based on the sender, recipient, or domain. Hybrid Email comes integrated with Webservio's Message Routing service. Multiple routing systems in at least two geographical locations provide maximum uptime and reliability. Webservio's Hosted Exchange is hosted in a highly reliable cloud system with a 99.999% uptime guarantee. Choose the version of Microsoft Exchange (2013 or 2016) that works best for you. Microsoft Office 365 provides enterprise-level features at a small business price, making it a popular choice for many organizations. This cloud-hosted service provides options for email, collaboration, project management, file storage, document editing, and more. G Suite includes familiar Google services like Gmail, Drive, Docs, Hangouts, and Calendar along with special apps to create business documents and websites. It is an excellent choice for teams working remotely. If you are already using Google services for collaboration, consider taking your work to the next level with G Suite. Our Izzymail VPS is popular for its cost-effective balance of flexibility and security. Each VPS system has its own dedicated IP with firewall protection. The VPS is only used by your organization, and our engineering team can help you customize the settings as needed. There is no limit on the number of users, and you can add disk space or other server resources as needed. By default, Webservio email hosting comes with the protection of SpamWeeder Premium for domain-wide spam and virus filtering. If you need more granular and customizable filtering options, we have a range of email security services to choose from. If you would like to learn more about Webservio's Hybrid Email solutions, contact us or schedule a phone consultation today.